Project obstacles and solutions: An aging bridge in downtown Louisville, Kentucky needed to be replaced where Main Street/Mellwood Avenue crosses the south fork of Beargrass Creek. To preserve the historical appearance of many of the downtown bridges, the Louisville Department of Public Works had created a historic mix design that was used when working with sidewalks that abutted older concrete in the downtown historic district. 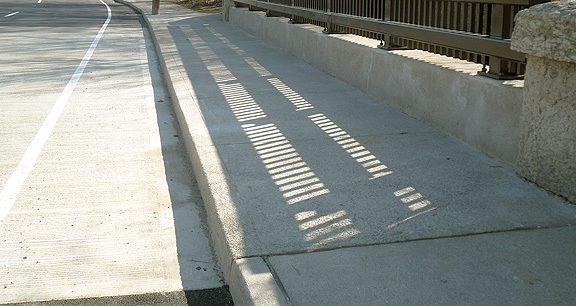 In this case, American Contracting not only had to build the sidewalks, but the bridge walls to match the existing concrete. Matching the color and texture of concrete that is nearing 100 years old is quite a challenge. IMI worked with American Contracting and the Kentucky Department of Transportation to provide a concrete that not only matched, but met structural specifications. The tricky part was getting the coarse and fine aggregates in a mix that matched the existing, weather worn concrete. American Contracting used a surface retardant after the concrete was finished to expose the aggregates. The sidewalks were finished with a micro-etch curing retardant. The walls were exposed at a greater depth to expose larger aggregates to match the existing weathered walls. For more information on exposed aggregate concrete, click here. For more information on coloring concrete, click here.